Diving brings happiness to paralysed son Jump to media player Sam Asbury says scuba diving gives him "a sense of calm" after he was left paralysed as a teenager. Robot suit lets paralysed soldier walk Jump to media player James Johnson, who was paralysed in Afghanistan, is using an exoskeleton to walk again as part of a pioneering programme. Paralysed man walks with robot legs Jump to media player Simon Kindleysides, who lost the use of his legs in 2013, says it is an "incredible feeling" to walk with robotic legs. Man in robotic suit kicks-off World Cup Jump to media player Millions of people tuned in to watch the opening ceremony of the World Cup last night. The show was kicked off by a man wearing a robotic suit called an exoskeleton. 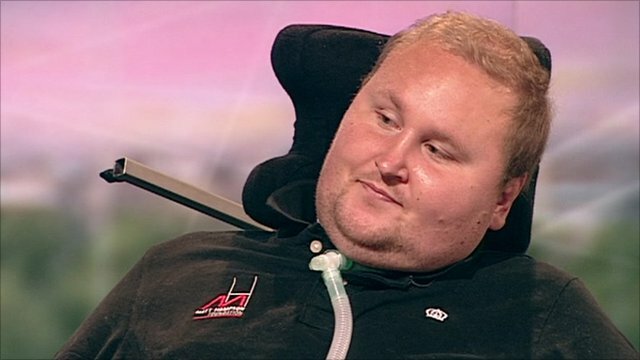 'Paralysis made me a better man' Jump to media player Matt Hampson was an aspiring England rugby player when he was injured in a scrum and paralysed from the neck down. He talks about how his life has changed. 'I beat paralysis to row for Britain' Jump to media player David Smith has gone from critical surgery to remove a tumour embedded in his spine to representing Britain at the World Rowing Championships. A former sportsman left paralysed after a cycling accident has described how scuba diving is helping to rebuild his confidence. Sam Asbury, 22, from Norton Canes, near Cannock, Staffordshire, broke his spine when he was thrown from a bike at the age of 14. Mr Asbury is now having scuba diving lessons along with his dad, with the British Sub-Aqua Club. "It's the first time I've properly enjoyed doing something," he said. For more stories like this follow Faces of England on Instagram.